Bottarga! I just love bottarga! I’m lucky enough to have a friend who’s half Sardinian and everytime she visits her relatives in Alghero she always bring me back bottarga! And fresh bottarga is something you’ll never want to live without! One fo the best way to enjoy it is sure iver a slice of warm bread, spread i with a bit of butter and plenty of bottarga thin slices! The other great way is with spaghetti and cherry tomatoes, grated! oh my father would just love this ! it’s so fresh looking, that pasta looks amazing ! and reminds me why i don’t eat pasta in the UK, there’s nothing like that here, well not that an italian would find acceptable! but maybe thats just my ‘cooking’! Hi Sara, your new home is lovely. The header is particularly inviting. I tried subscribing to your new feed but I got a message saying that there is error in the code. 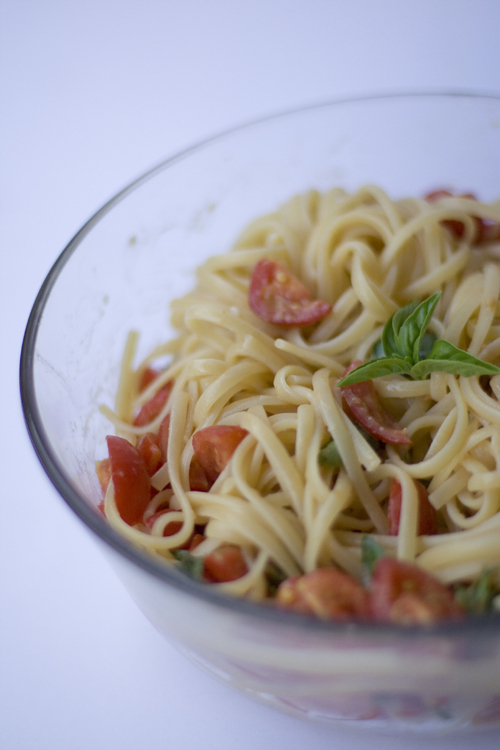 Simply tossed in spaghetti is the way I got to know it – this looks great! I really love Bottarga too! Had to let you know we tried your recipe! It was delicious! The best ever! Simple is best! Love the picture – and am sure it tasted great. I love bottarga too! Nice recipe!